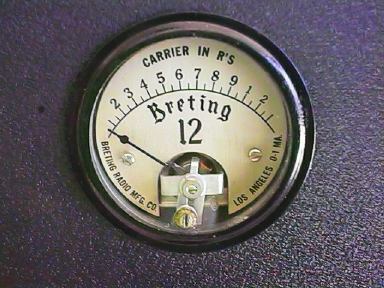 I picked up a Breting 12 and a home made speaker on one of the newsgroups about three years ago. 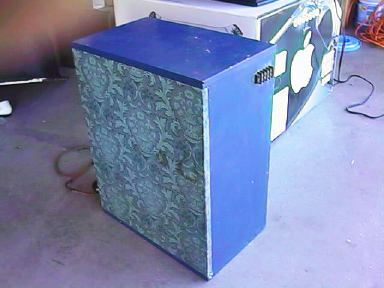 The guy I bought it from told me that the radio had been painted blue and had a homebrew matching blue speaker. The price was $100 plus shipping to Arizona from California so I went for it not realizing the rarity of Breting receivers at the time. Fortunately the two pieces were only only coming from California as the two pieces are pretty heavy so shipping was not bad. 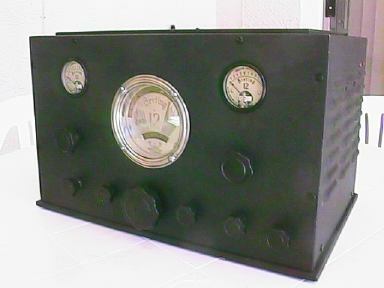 The radio weighs around 60 pounds and is very well built. 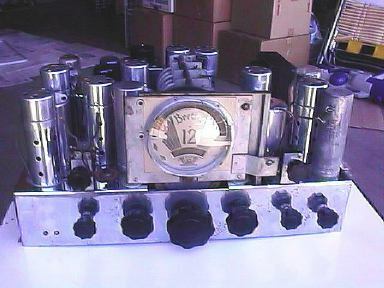 With it's 12 tubes and chrome chassis it is built in the style of the Scott receivers of the 1930's with performance to match. The unit sat in my garage until last June when I looked at it in it's sad blue state and considered getting rid of it due to having to many projects. 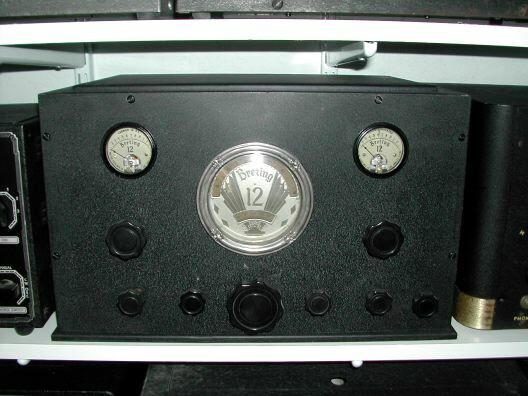 Not only was the radio painted blue, but the knobs and escutcheon had been tastefully? painted gray. Of course I could not get rid of it with out seeing if it worked. After doing some preliminary checks, I applied power and it sort of worked. It had a very badly messed up volume control. After getting some de-oxit into the control, the problem went away and the radio sounded really good. In fact the audio with it's homebrew speaker sounded better than my SX-28/PM-23 combination. 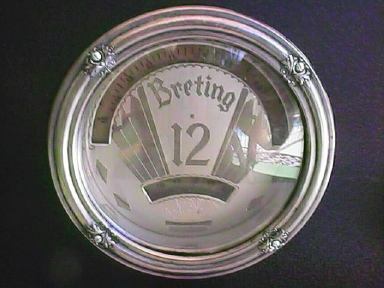 The audio section of the Breting 12 uses a pair of 42's driven by a 42. 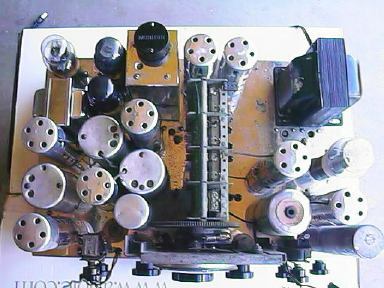 The rest of the radio consists of 6D6's, a 6C6 and several 6B7's. I decided at this point to keep the radio. 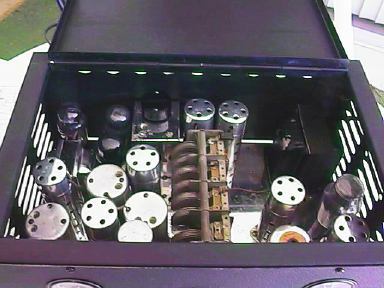 I disassembled the unit from the cabinet and began to work on the electronics which amounted to recapping it and replacing 2 bad tubes. 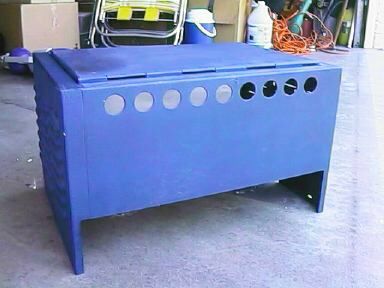 The real problem was the cabinet with it's blue paint. When I was into model railroading, I used to paint models with an airbrush. When I screwed up, I would strip the paint job off with brake fluid which would not harm the plastic. I decided to try it. If it took off the original paint, than I would have to repaint the radio. If it worked, than great! I had nothing to lose at this point. I first tried the brake fluid on the base and volia! 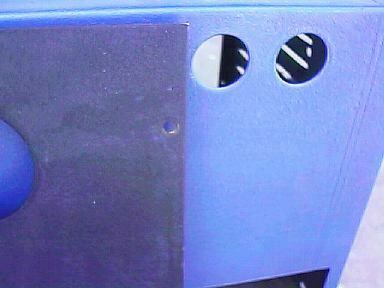 It took off the blue paint and beneath it was the original black wrinkle finish. I had to use a couple of applications of the brake fluid and do some scrubbing with a scrubber pad. After cleaning and washing off the brake fluid and drying the piece in the sun, I cleaned it again with WD-40. The base looked pretty good. Next I did the panel and it turned out great. I was not able to get 100% of the blue paint off. What remained though is nearly invisible and I would likely have to point it out or you would not see it. The final piece was the cabinet and it was quite a bit of work due to it size and all of the louvers but it also came out looking good. 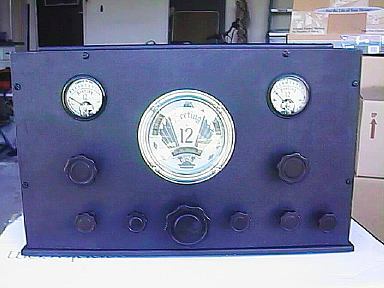 The radio had been modified. One of the former owners decided to do away with the tone control which was a pot on the ac on/off switch and replace it with a multi-position switch to the right of the tone control. This required drilling another hole. I decided to leave this alone as it worked OK and does not look that bad. The Breting 12 like the RME69 has no panel markings so the extra control is not that big of a deal. It would have been nice if he had been a bit more careful in centering the hole in line with the other controls. The paint on the meter casings was pretty badly chipped. I cleaned this up with a permanent magic marker and they ended up looking very nice. The panel after stripping the blue paint next to the cabinet. The blue cabinet before cleaning up. 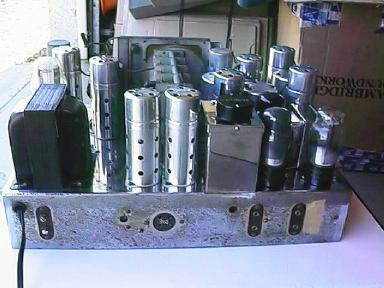 The chassis with all of it's chrome! 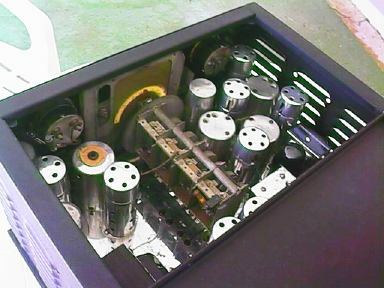 Under the chassis after recapping. I do not use Orange drop caps! 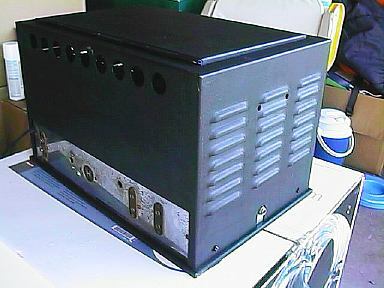 The chassis from the back. Unfortunately their is some corrosion of the chrome. 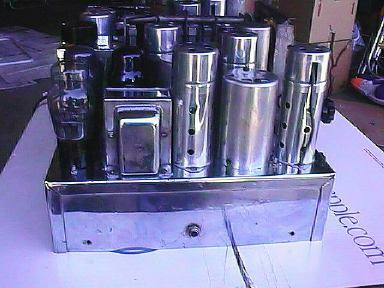 Top down view of the chassis showing the crystal filter and more chrome! 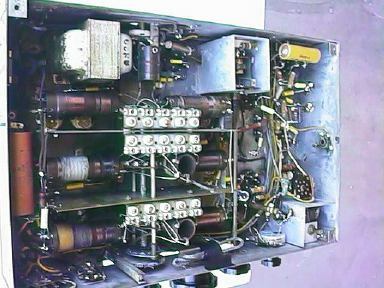 Another view of the radio. 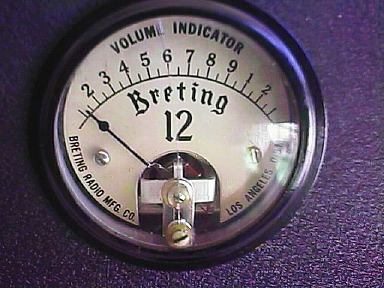 The volume indicator meter. Unfortunately, the glass is cracked. Looking inside from the front. Looking inside from the back. The homebrew speaker. 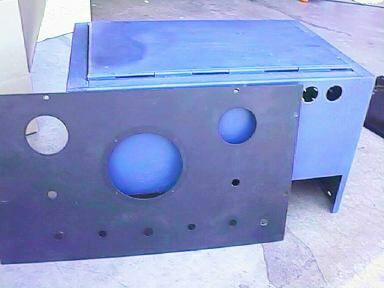 This receiver requires an electrodynamic speaker. I have not decided what to do with this yet. Will probably paint it with black wrinkle paint and replace the blue cloth with something more color coordinated. Despite it's looks, it really sounds great and has really nice bass response!